Some stories about formaggio, käse, queso, جبن, fromage, tupí, or whatever you wish to call it (just don’t say Velveeta®). My old neighbors up in Wisconsin have found yet another use for one of the byproducts of cheesemaking. 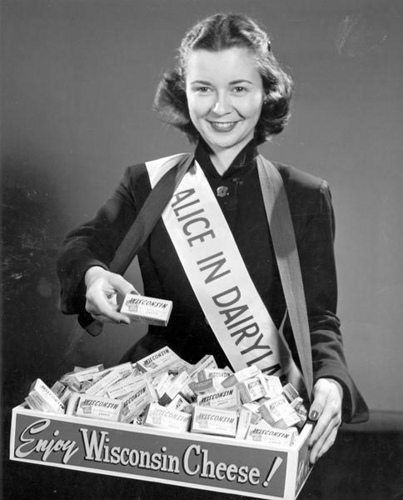 As you know, winters in America’s Dairyland last anywhere from six months to seven and a half years at a time. Driving, of course, can be hazardous when the pavement becomes icy. Lo and behold, the solons who run this holy land’s beer capital have turned to cheese brine to treat the city’s streets in wintry weather. I’ve whipped out my trusty copy of Cheese Primer by Steven Jenkins (a must for any complete home library). Jenkins begins his scholarly tome by describing the cheese-making process in loving detail. You can actually do it at home, honest. So, cheesemakers use this brine and then, once the proto-cheese is removed, must do something with it. Funny story: hundreds of years ago in the old principalities of Italy, cheesemakers would dump their used cheese brine and whey (the semi-transparent liquid that results after cheese curds are formed) into city sewers. Natch, the sewers got all clogged up. Officials of the various cities leaned on cheesemakers to do something about the problem and were promptly told by said perpetrators to mind their own goddamned biz. Demonstrating, of course, that business interests have forever been opposed to pro-environmental action. Eventually, the clogged sewers became unbearable even for those who were making scads of pre-lire on the process that created the trouble in the first place. So, the cheesemakers came up with a solution: They would take the whey and brine and cook it once again, gelling the remaining casein (solid cheese protein) in it, and creating a new kind of cheese. They called it ricotta, which means, literally, recooked. One tucked-away county in Wisconsin began treating its icy streets with cheese brine five years ago, combining it with the more familiar street salt and sand. The county, apparently, has saved a lot of scratch in this manner since then. Milwaukee, which wants to save bread as much as the any other municipality, tried using beet juice a few years ago (swear to god). But the red stuff, mixed with rock salt, became a gooey mess, so that was out. Enter cheese brine. Milwaukee’s street crews have been using it on bridges for almost a decade and now are spreading it on the city’s general roadways. There is one drawback to cheese brine. It smells like, well, cheese. Now, a lot of people (me, for one) would have no problem with city streets smelling like parmesan (the American knock-off of Parmigiano-Reggiano) or Emmenthaler (what we normally refer to as Swiss cheese). Others, though, are victims of a certain hyper-sensitivity to the heavenly aromas of things like garlic, anchovies, or cheese, the poor dopes. Milwaukee: We Provolone Our Streets for Your Safety! Now, here’s a crazy cheese story. Anyway, the cheese story, yes. 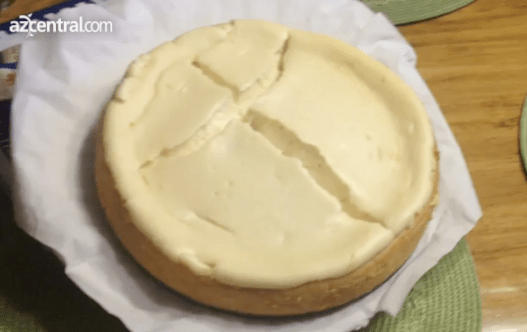 Journalist Krystle Henderson of AZCentral reported on X-mas day that a local family had made a cheesecake and, after it had cooled, removed the wax paper from the top of it and guess what they found? Yup, a crucifix. The image of the very one, in fact, that the creator of the Universe in human form was executed upon in Jerusalem some 2000 years ago (or one-third of the entire history of all creation, acc’d’ng to Bishop Ussher). Which reminds me of a line by Lenny Bruce: If Jesus Christ had lived in modern times, all the Christian kids would be walking around with little electric chairs on chains around their necks. Back to the Arizona cheesecake. The family has said it won’t eat the cake but will sell it. See, that family isn’t the only one in this holy land that sees mythological divine beings in pastries. Apparently, tons of other religionists will want to spend big dough to possess an item that is sure to go bad, even refrigerated, within a couple of weeks. That is, unless the cross that appears on it really is a sign from the putative most powerful being in all of existence. Say the cheesecake miraculously stays fresh and fluffy for months or even years. Wouldn’t you drop to your knees, spread your arms, and shout to the Big Daddy-o in the Sky, Ya, hey d’ere, I’m wit’cha, Dude! Or, the new owner of the cheesecake might have invested in an expensive industrial blast cooler, thereby preserving the cake for something approaching posterity. Either way. I would have been like ‘Oh man, am I dumb, I ruined the surface. Hope I learned something here.’ Funny how others think so differently. BTW: Why couldn’t the stigma on the cheesecake have been the handiwork of Papa Bear George S. Halas who, many Chicago football fans believe, must surely be in heaven? Halas invented something called the T-formation, wherein the quarterback stands here and the halfback stands there and the eighthback…, oh wait, there’s no such thing. Anyway, a bunch of fractional players stand here and there before the snap of the ball and, way back in the 1930s, this innovation caused the eyes of opposing coaches to roll toward the backs of their heads. We’ll never forget the way you thrilled the nation with your T-formation…. Which proves, I suppose, that the nation was quite easily thrilled way back in the 1930s. Couldn’t Saint George Halas be trying to communicate with his team who, coincidentally, are playing the Green Bay Packers this afternoon for supremacy in their division? 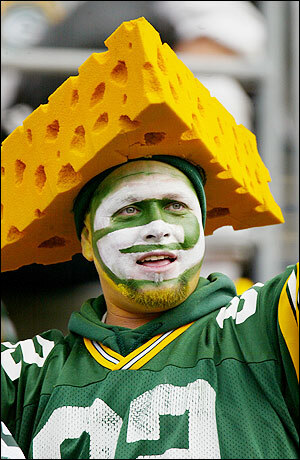 Couldn’t the message be that cheesecake is superior to a cheesehead?